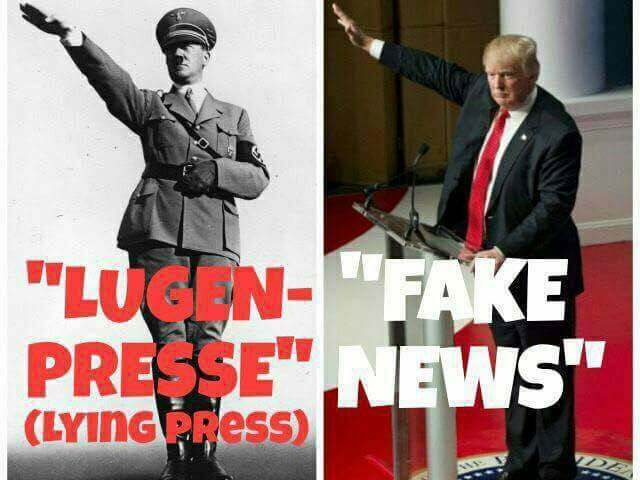 "Lugen Presse" means lying press. To prevent a blue wave on Nov. 6, [Trump] the president and his puppets are traveling audaciously far from the truth and shockingly deep into the gutter. I’ve seen bad before, but not this. The midterms aren’t just a referendum on which direction the country will go. They’re also a test of where the limits of decency and shamelessness are drawn. Republicans especially . . . have outdone themselves. I’ll get to Trump shortly, but the saddest and scariest part is that I really needn’t get to him at all. In the Arizona battle for an open Senate seat, Representative Martha McSally, the Republican nominee, used a 15-year-old quip about the Taliban by Representative Kyrsten Sinema, the Democratic nominee, to say that Sinema is guilty of treason. In Ohio, Representative Jim Renacci, the Republican who is trying to unseat Senator Sherrod Brown, told the editorial board of The Cincinnati Enquirer that “multiple women” had contacted him to say that they had been assaulted by Brown between 1987 and 2004. Renacci offered no names, no details, no way for anyone to look into the matter. He just dropped the bomb and moved on. In at least four House districts around the country, Republicans twisted aspects of Democrats’ pasts for inflammatory television commercials that alleged a tolerance for terrorism or an indulgence of it. And in one House district in Arkansas, a renegade Republican super PAC even produced a radio ad that suggested that white Democrats would be "lynching black folk again" if their party won. Representative Matt Gaetz, a Florida Republican, blithely lofted the unfounded speculation that the liberal philanthropist George Soros had funded the caravan. On Monday, an undetonated explosive device was found outside Soros’s home in the New York City suburbs. And Corey Stewart, the Republican challenging Senator Tim Kaine in Virginia, went out of his way to opine that Jamal Khashoggi, the Washington Post contributor murdered in the Saudi consulate in Istanbul, “was not a good guy himself.” I’d dismiss that as the ranting of one practiced provocateur, but as Robert Costa and Karoun Demirjian wrote recently in The Post, it belonged to a “whispering campaign” by some Republicans to “protect President Trump from criticism of his handling” of the Saudis. Anything, no matter how grotesque, for leader and party. Maybe it’s desperation. The Republicans’ one huge legislative accomplishment over the past two years — the tax overhaul — is much less popular with voters than they had hoped it would be. The role model’s whoppers are quadruple-patty in these final, furious weeks. He has again conjured the hallucinatory specter of rampant voter fraud, the kind he once cited to explain away Hillary Clinton’s winning of the popular vote by nearly three million ballots. He has claimed nonexistent riots in California by people upset about living in sanctuary cities. He has insisted without proof that there are “unknown Middle Easterners” (his proxy for “terrorists”) in the caravan of migrants. He has insinuated that deep-pocketed Democrats paid the migrants — which makes zero sense, because images of them are more likely to help anti-immigration Republicans than their Democratic adversaries. But it’s not all darkness from Republicans. Sometimes it’s phony light. At several recent rallies, Trump boasted that he and Republican leaders were sprinting to devise and potentially enact an additional “10 percent tax cut for middle-income families” before Nov. 6. That would require more than just budgetary magic. It would call for some epic scheduling sorcery. Congress is in recess until after then. Meanwhile, many Republican candidates who fought proudly and persistently to junk Obamacare without any suitable alternative are brazenly denying that past and fashioning themselves as the planet’s greatest champions of guaranteed health insurance for Americans with pre-existing conditions. That’s less an artful flip-flop than an extravagant fiction, and it’s of a piece with Republicans’ sudden complacency about deficits now that they’re ballooning under the party’s governance. Besmirch first, worry about the fact checkers later. Or don’t worry about them at all. That’s Trump’s ethos, and nothing would make him happier than the devolution of American politics from a contest of ideas to a contest of inventions. Trump is a clear and present danger to the nation and is displaying the same type of most frightening lies of history's tyrants and mass murderers of the past. My "friends" who continue to support Trump and the liars in the GOP have forfeited any pretense that they are decent, moral people. It’s immoral and depressing. It’s incredible the damage Cheeto has done out of fear of having the press discover his corruption. Ugh.